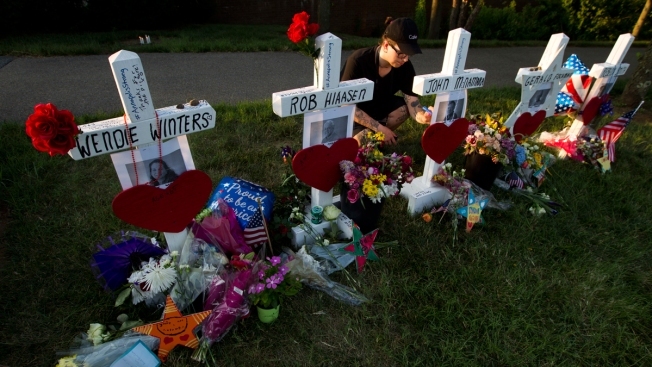 In this Sunday, July 1, 2018, file photo, Kurt Emrick writes on John McNamara's cross at a makeshift memorial at the scene outside the office building housing The Capital Gazette newspaper in Annapolis, Md. Four journalists at The Capital Gazette are among six U.S. journalists that died in 2018. Media freedom group Reporters Without Borders said Tuesday it has recorded an increase in the number of journalists killed and imprisoned worldwide so far this year. The Paris-based group, also known by its French acronym RSF, said 63 journalists died in relation to their jobs from Jan. 1 to Dec. 1, 2018, compared to 55 in 2017, as well as four media workers. Another 13 people it described as "non-professional journalists" — people who didn't have official media cards but who were involved in the production of news and information — also died, while 348 were held in detention around the world. "Non-professional journalists play a fundamental role in the production of news and information in countries with oppressive regimes and countries at war, where it is hard for professional journalists to operate," RSF said in a report. Of the 80 people in total listed as killed, the group determined 49 were deliberately targeted "because their reporting threatened the interests of certain people in positions of political, economic, or religious power or organized crime." The other 31 died in the field while reporting, RSF said, adding that the group was investigating a further 10 deaths to determine whether they were related to journalism. The deadliest country for reporters in 2018 was Afghanistan, where 15 died in violent attacks such as bombings, followed by Syria with 11 and Mexico with nine. The U.S. made it into the top five deadliest countries for journalists this year for the first time, with six dying, including four who were among five people killed by a gunman who opened fire in the offices of Maryland newspaper Capital Gazette. Another two died while covering extreme weather. A bright spot was Iraq, where no media deaths were reported so far in 2018, for the first time since 2003. MSF listed China as the biggest jailer, holding 60 people, 46 of them described as non-professional journalists "who have tried to compensate for the Communist Party's increasingly tight control on the traditional media." Ten of those, the group said, were in danger of dying in Chinese prisons. Turkey was the world's biggest jailer of professional journalists in 2018, according to the report, holding 33 of the total 179 being held in detention worldwide. In Egypt, 30 of the 38 journalists being held were still awaiting trial, the group said, including one who has already been held for more than three years without being officially charged.